Plantar Fasciitis may seem "incurable", but it's not! There are lots of great treatments besides the usual and mostly ineffective "Icing and Stretching" advice that doctors suggest. How long have you suffered with heel pain? How can I help you survive your heel pain? Do-it-yourself Treatment Videos for Pain Relief Today! Are you tired of Plantar Fasciitis ruling your life? Does it feel like the pain is never going to end? 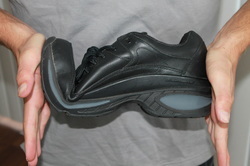 Do you feel a dull pain in your heel every single day? Do doctors disappoint you with every visit, never seeming to understand how bad the pain truly is? Do your friends and family think you’re crazy, saying things like "it's in your head" without understanding why you aren't getting better? Do weeks and months go by with continuous, unexplained heel pain? I know those feelings, and I want to help. I suffered from the pain and frustration of plantar fasciitis for three years. For five months straight, I couldn't walk. I lost two jobs because I was unable to work. When the frustration, pain, and disappointment were too much to bear, I began to experiment with little-known methods of treatment. The methods I encountered were so effective that I was amazed that others did not know about them. I knew I had to get that information to others like me. With this site, I hope to educate the average person as much as possible about what is causing their heel pain, and what they can do about it today!